Small soil blocks with snapdragon seedlings ready to go to the garden. Most gardeners confess that they’ve always wanted to start seeds. Some are too scared to even give it a try. Many attempt it with high hopes and miserable results. Sound familiar? If you are a wanna-be seed starter and have failed, you should know you are not alone. In fact you are a member of the majority. There are only an enviable few that seem to do seed-starting successfully. When I was investigating becoming a commercial cut-flower farmer in 1998, it looked like I had all the right pieces; it was all falling into place. I had just married this guy along with a great piece of land. He and the land came with the equipment to start farming and I could quit my job to do it. It was all looking so promising. Then I realized I would have to start my own seeds– thousands of seeds in fact. Big problem. As a gardener, I had attempted in the past to start seeds. However, each effort ended the same: no sprouting. Even more tragic, a few sprouted only to keel over dead when a couple of days old. It was a sad state of affairs. Looking back now, I see it was not a total loss. 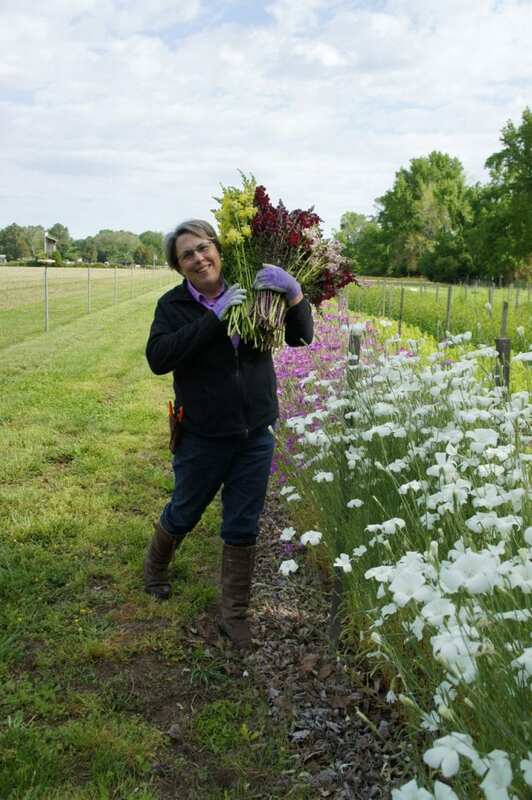 My dreadful seed starting beginning was what led me to ultimately develop the chronic optimism that is paramount to my successful career as a cut-flower farmer today. The snapdragons in my arms were plants transplanted in the garden. The Corn Cockle in the garden (white and purple flowers) were seeds planted directly in the garden. I almost kicked the whole farming idea to the curb over this crazy seed-starting hurdle. I actually set it aside for 2 years before mustering up the courage to try again. I vowed to do a little research and figure it out. Fast forward to today. We start ten of thousands of seeds each season on our farm and have made seed starters out of many folks along the way. What turned the tide for me? Learning that there are a few ground rules to follow opened the door to seed-starting success. Perhaps the “aha” moment came when I realized that if you give the seed the conditions it needs, it will sprout and grow into a healthy seedling–every time! The challenge is providing those conditions in your environment. Most folks are attempting to start seeds in their homes. That’s exactly where I did it for the first 4 years of my farming career, later building a workshop. That’s where our seed-starting takes place now. You see, I am an urban farmer located in the midst of a city. This means that building a greenhouse is prohibited. So, all of our seed-starting and seedling-supporting happens indoors as it does for most home gardeners. 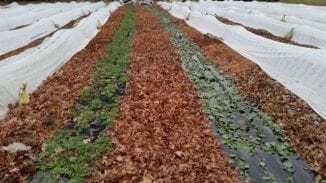 Transplants grown in the small soil blocks planted into biodegradable mulch film with pathways mulched with leaves. 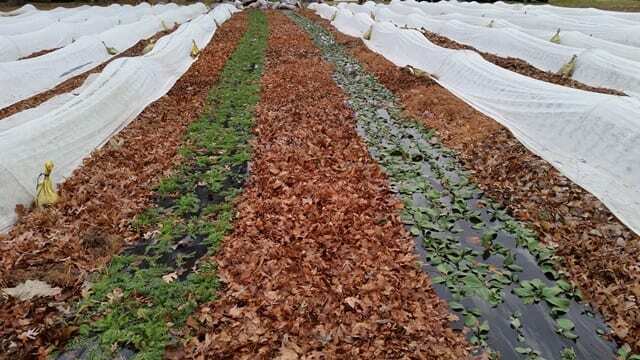 The row covers are left on all winter for wind protection and to prevent deer from grazing on plants. Seeds that prefer being started indoors. Seeds that prefer being planted directly in the garden. 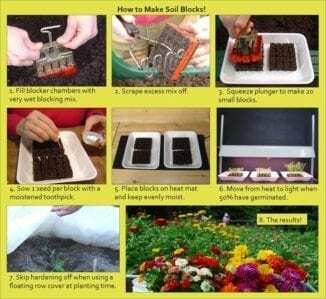 Seeds that can be started indoors or planted outdoors in the garden. So, if you are not able to provide indoor support (seedling heat mat and a grow light), don’t choose seeds that fall into group 1, for example. Choose seeds that like being planted directly in the garden. Choose your seeds based on those you can provide for–this one simple step can turn your seed-starting life around! If your seed packet doesn’t tell you the method your seeds prefer, simply enter the seed name into a search engine along with “sowing instructions.” You will have no shortage of choices for further research. 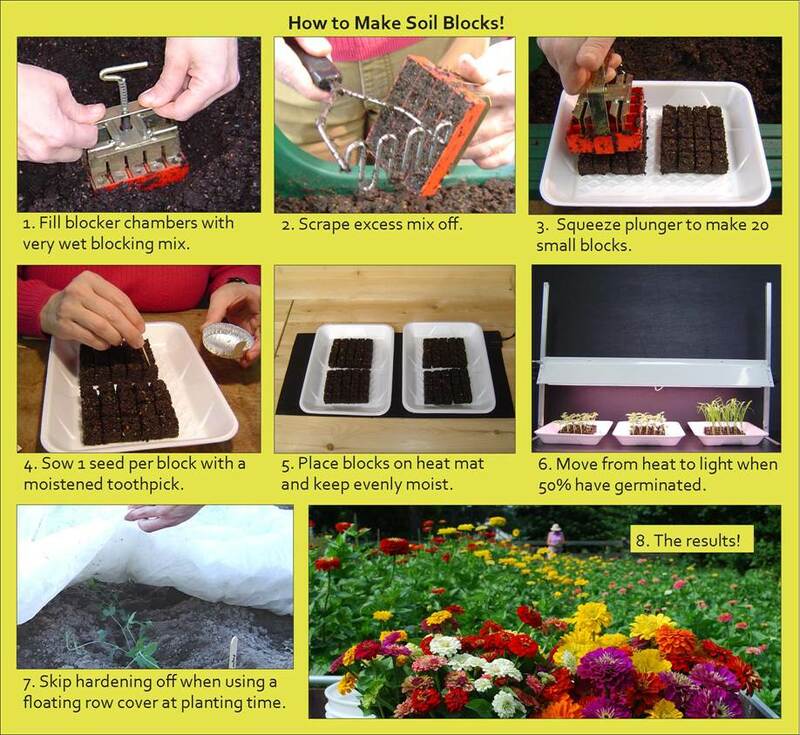 Steps to soil block. Watch a short clip of soil blocking. Knowing how a seed wants to be started is the first step to easy seed-starting success. To learn more about seed starting pick up a copy of my book, Cool Flowers that includes a chapter on seed starting. To shop our seed-starting equipment and supplies click here.